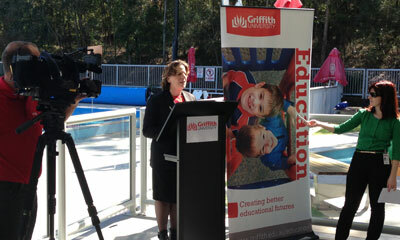 A final report was just released by Griffith University in Australia as to findings from a four year research study into the Social Capital Benefits of Early Years Swimming Lessons. Generally speaking, those children having lessons were significantly ahead on many important cognitive and physical milestones, resulting in them being in a much better position to get off to a great start in pre-school/school. Pictured here is world renowned early childhood education researcher Professor Robyn Jorgensen, presenting the findings.